myPause allows you to take control of this potentially confusing time in your life – the Pause. Get a better understanding of what’s happening with your body and its hormones. Did you know there are more than 30 symptoms of menopause? Most women don’t! Journal: Track the 35+ symptoms that may affect you over the entire period of perimenopause and menopause. Plan: Create a treatment plan so you can minimize any effect on your quality of life. 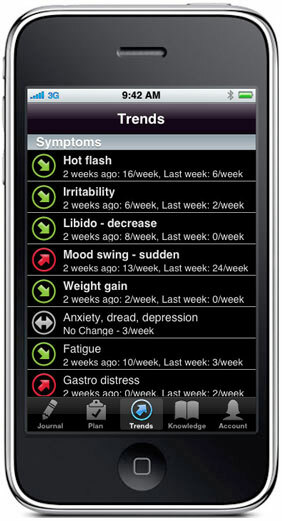 Trends: Check how your symptoms are affected by the treatment plan and make adjustments accordingly. Knowledge: Expand your understanding of key menopause terms and information. Each woman’s experience during this transition will be unique. No one can predict exactly what your experience will be, but the more information you have at hand about your symptoms and the possible treatments, the more in control you will be. By its very nature, menopause treatment is a time of trial and error especially in treating your symptoms specifically. Tracking your symptoms and your chosen treatments' effect will make for a more effecient process. Helpful answers with demo videos to get you started. Simply start using it and see how quickly it becomes a daily habit. How can I join the myPause community? Now that you have the tools, start managing your menopause on your own terms. Thanks for celebrating the launch of the App Store’s first Menopause Tracker app. Congrats to the winners!! See details.